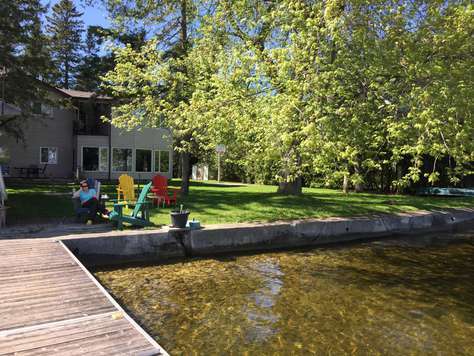 Family and pet friendly vacation home on Greens Lake in the Kawarthas near Catchacoma features a gradually deepening sand bottomed swimming area, safe for children, and a pinball gallery in the rec room. It also includes a row boat, canoe and paddle boat and a large dock for sunning and swimming. 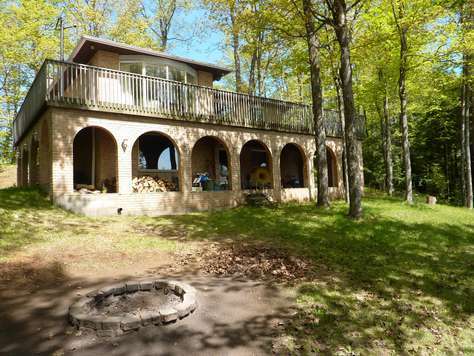 The large property allows sufficient privacy and lots of area to play and has a firepit overlooking the lake. Large decks run across the front and down one side on both upper and lower levels accessed by sliding glass doors. Indoor activities include more than 100 movies, lots of books and puzzles. This 3 bedroom - plus extra sleeping facilities - 2 bathroom cottage can accommodate 8 people comfortably. Beds consist of 1 queen, 1 double, 1 set of bunk beds,1 single, pull out couch and 1 extra single mattress. Brand new pillow top queen mattress. 2 ¼ hr. drive from Toronto, it is available from April (for the fishermen) to mid October. If you have an extended family and you are interested in renting 2 cottages please inquire as onother one of our cottages in on the same road. This is as close to heaven as a cozy cottage on a lovely waterfront property can be. Take the paddle boat out or swim to a rock island 300 feet from shore. Bring your boat for great cruising on a large long lake or for the fishing the lake is famous for. Soak in a deep clawfoot tub and settle in air conditioned comfort on a comfortable couch with a view of the lake. Four TVs each have satellite reception including one in the Bunkie. 2 New air conditioning units now installed in cottage. Only 5 minutes from Buckhorn with its summertown facilities and many events. NEWLY RENOVATED FOR 2019! 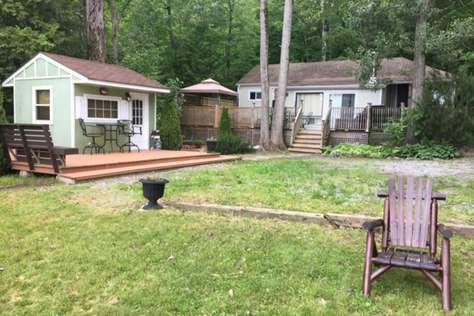 Four seasons three bedroom plus Bunkie cottage on a one acre lot steps from a hundred feet of sandy bottom waterfront with two docks that can accommodate two boats, boat launch is five minutes from the cottage on the same lake. Two queen beds and one double bed in the main cottage and 3 doubles in the Bunkie, All the comforts of home including dishes, pots and pans, towels and bedding. Flat screen T.V in the Master bedroom and Living Room, air-conditioning, wood stove, books, board games and movies. Apple TV, Canoe and paddle boat are supplied and ready to go, or pack up the family and take a short boat or canoe ride across the lake and spend the day at the jumping rock that has two elevations (20 and 35ft) This area is set next to a small island with a beach and fire pits perfect for camping. 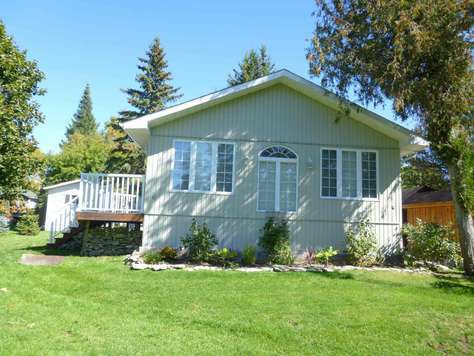 The cottage is twenty-five minutes from the township of Havelock that has a hardware store, grocery store, liquor store, restaurants and most importantly Tim Horton's. Just show up and enjoy the great fishing, boating, water sports, sunsets over the lake or evening campfires. This cottage has a spectacular view of the Trent Severn Waterway from the staircase or from any angle outside and inside the cottage. You will imagine you are in the heart of the Kawarthas. This is a excellent retreat for individuals "couples", fishermen and families with older children. Inside the cottage it has open concept, living, dining and fully equipped kitchen. Both bedrooms have queen size beds. There is also a Bunkie for another family or for the kids to hang out in. It has open concept with living room, kitchen, bathroom and bedroom. Grocery store is just 5 minutes away. Also enjoy the Kawarthas Spirit boat tours that run daily. Fenelon Falls has lots to offer during the summer months. Just minutes from the town of Coboconk awaits the Balsam Breeze cottage. 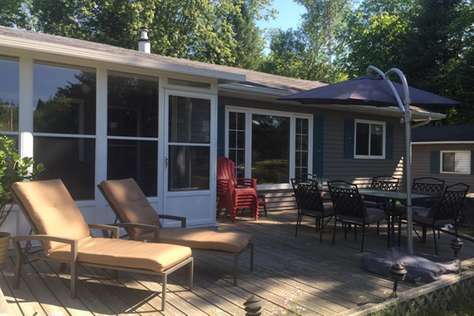 Situated on a well treed lot with a great view of the lake from the inside of the cottage, the outside deck or at the lower dock area. Uninhabited land across the lake. Large deck across the front of the cottage for entertaining or just to enjoy relaxing or reading a book in the Muskoka chairs. There is a new U shaped dock at the water to park your boat. Also you can rent boats, sea-doos, etc from the marina on the lake. The perfect family get-away on beautiful Balsam Lake has toys for everyone – canoe, trampoline, a child’s play house, kids’ climber, and a hot tub. There’s even a dog run. This roomy, attractive cottage is modern, comfortable and decorated playfully, both inside and out. A large, modern kitchen makes for pleasant meal preparation, and you can choose to eat in a screened porch, a formal dining room, at the kitchen table, or at a picnic table overlooking the lake. As evening comes on gather around the campfire and listen to the gentle lapping of waves. This is the perfect place for an extended family or 2 families with children. Nestled at the end of a quiet dead end street, this beautifully decorated 4 season bungalow sits on 100 feet of picturesque waterfront. 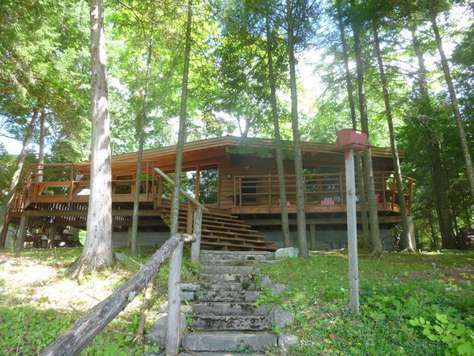 Featuring 3 spacious bedrooms, 2 full 3 piece baths, fireplace and 2 large decks. This is a tranquil family cottage perfect for the whole gang anytime of year. Bring your boat, this property offers a large dock and public boat launch just 5 minutes away. Large level lot with plenty of space to play. Relax and watch the blue jays, woodpeckers and deer from the fully screened sunroom. Outdoor lounge chairs, fire pit, Muskoka chairs, outdoor dining set, BBQ, canoe, paddle boat, lifejackets, tv with DVD player, tons of movies... This place has it all! Located both 10 minutes from Fenelon Falls and 10 minutes from Coboconk, all amenities and shops are at your fingertips! Swim, boat & fish from sunrise to sunset and then curl up by the fire and enjoy the stars. BRAND NEW TO OUR INVENTORY! Main: 5 bedroom, 3 bathroom , Bunkie 2 bedroom, 3 piece bathroom, 2 Storey 2600 square foot cottage with approx 400 square foot bunkie. The main cottage consists of 5 bedrooms ( 3 queen, 1 double, 1 bunk) with 3 bathrooms ( 1 ensuite). Bright, open concept kitchen, livingroom and diningroom with breathtaking 21' of bay windows, 100' southern exposure, crystal clear waters. Stunning oak floors in main area, with tongue and groove pine walls thoughout. Surround sound entertainment with a 52" tv as well as 46" HD LCD TV. Shallow lake with easy entrance to gradual slope. 9' x 9' floating cedar raft with ladder, quick swim away from main dock. 6' x 42' cedar dock with 12' x 18' deck at end - ladders ( one in shallow end for kiddies entrance) and set of boating mooring whips. A second 20' dock for paddleboat, 2 kayaks, and canoe. Also enjoy the horseshoe pit, badminton court and the outdoor campfire pit. 2 bedroom bunkie that comes with 2 doubles and a 3 piece bathroom, open concept with livingroom, dining room kitchenette area with full fridge and microwave. Laminate flooring thoughout. Bunkie also includes a colour TV/DVD for movies only. Over 150 movies (DVD and VHS in collection) BBQ has direct line propane (no tanks) Enjoy an evening around the outdoor firepit roasting marshmallows.